"'Current Scene' To Air Comic Book Problem." The Hartford Courant, 26 February 1954: 1. Web. 29 July 2018. 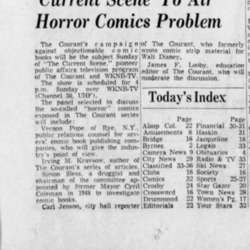 Unknown, “'Current Scene' To Air Comic Book Problem,” A Crisis of Innocence, accessed April 25, 2019, http://crisisofinnocence.library.ryerson.ca/items/show/707.